Betfair is a unique player on the betting market, as it is not only a classic bookmaker like most of them out there. They added a new touch to Esports betting as they are treating the platform like a stock exchange. They are part of Paddy Power Betfair plc, and they started back in 1999 with offering sportsbook. Shortly they got into online betting as well. They are mainly focused on the UK, but by now they have customers all over the world. Betfair is one of the biggest and the first betting exchange on the market. That means that they are not just a bookmaker but also a betting exchange, a place where you can bet against other players and not only against their bookmaker. That feature is innovative and makes especially Esports betting at Betfair exciting as it creates a community feeling and is more interactive. But apart from that Betfair is still a bookmaker and offers more traditional ways of betting. They also have great bonus offers and promotions throughout the year so you will have a lot of excitement while betting on esports at Betfair. Betfair is mainly focusing on traditional sports, and therefore they offer bets on the most popular Dota 2, CSGO, Starcraft 2 and COD tournaments. They offer bets on the main tournaments, but they are expanding their offers and might get into smaller leagues as well. Betfair is focusing on the main events and most popular games for their esports betting portfolio. You can place map bets for Dota 2, Starcraft or Call of Duty or you can use them for your CSGO bets. Putting a map bet means, that you are betting on the winner of a map. You can also bet on a combination of map wins. Live betting is a great way to make your tournaments even more interesting, and you bet on a match while it is actually happening. You can decide during the match and take the performance of the team as a reference for Esports bets. Unfortunately, Betfair does not offer live betting yet, but they might have that option in the future. Betfair is a traditional bookmaker that offers a big variety of different sports betting options. You can place your bets on Football, Hockey, Ice Hockey, Basketball, Tennis and many other sports. The odds are high for the more typical games, and they are a fun way to vary the esports betting at Betfair a little bit. They also offer options to bet on social events and politics. So, if you want to make a bet on Brexit or US-Politics, you will find a lot of interesting options at Betfair. There is as well the option to bet on the Formula 1 or horse betting as well. Betfair offers esports betting for mayor tournaments in LoL, Dota 2, CSGO and other esports games. They provide good odds for the main tournaments, and they keep improving them continually. Especially for The International you can get some good odds from Betfair and use them to get some attractive wins for your esports bets. The bookmaker Betfair is offering attractive bonuses for new customers, including those who want to get into Esports betting. Currently, they are offering 100% up to €100. This bonus is not limited to esports, but you can use it for your LoL bets, or CS:GO betting. You have to place your first bets at odds of 1.2 (1/5), and all of the bets have to be made at 10 Euros. That amount cannot be split the amount between other bets. It is a great way to get to know the bets and bet on your favorite esports tournaments. 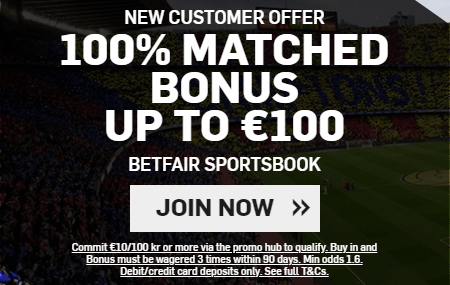 It is a generous bonus offer, and Betfair has more interesting promotions and other activities coming up. Use your 3x time deposit bonus and get the best out of esports betting at Betfair. Betfair makes it easy for you to choose between your favorite payment methods. You have the option to use Visa, Mastercard or Paysafecards or use quicker and more direct ways. You can also make your transactions via PayPal or other e-wallets like Neteller or Skrill. Most of the transactions are instant, and you can start right away using your esports bets at Betsafe. Most transactions are handled without any fees.